And finally, Control4 is building its own KNX drivers and KNX IP gateway to connect to the KNX bus. This means that the Control4 11,000-device ecosystem, which includes numerous entertainment systems, will be controllable using KNX without any additional hardware or software. 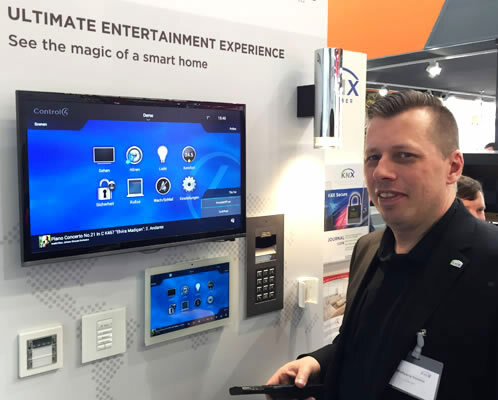 Control4 EMEA Marketing Manager Wolfgang Höhne presenting the Control4 KNX solution for whole-home control including entertainment. At this edition of the light+building fair, 27 KNX Members from 8 different countries were exhibiting with their own panels at the KNX booths in hall 8 and hall 11.1. You can watch the video to see the innovations they presented. Wir besuchen die Messe in Frankfurt. In diesem Video geben wir einen sehenswerten Überblick über die Themen Gebäudesteuerung und Multimedia. Wir verdeutlichen was wir steuern können, was man benötigt, wie wir es bedienen und dass wir die Gebäudesteuerung mit TV und HiFi kombinieren. Control4 hat ein klares Bekenntnisses zu KNX, daher unterstützt der neue Import-Assistent nun mehrere Premium Wandtaster-Hersteller.